UPDATE: Something happened to the pictures the first time I published, I’m assuming something to do with using my work computer instead of my personal one? Anyway, it should be all fixed now. Thanks for your patience and enjoy! Despite the best efforts of the flu, I managed to both make it to and survive my first week of elementary school teaching in Korea. The week was less than normal for several reasons, but it gives me a pretty good idea of what I’ve gotten myself into, and it appears to be good news. Korean kids study from about 9 am to about 11 pm (later for the high-schoolers). They start with public school, then do after school programs, private English schools, and subject tutors before going home to do more hours of homework. I think this speech was given to me a half a dozen times at orientation as a way of helping us understand what our students go through, and to give us some sympathy for them in our classes. English class is often the only “fun” class they will have all day (even the little kids), and kids will often end up falling asleep in your class because they were up past midnight studying. Also, your class is only one of 3-4 places they study English. but the kids are from economically disadvantaged homes and often receive little to no positive attention from their parents, let alone the costly private after school programs. In the first week, I’ve already encountered several special needs children, and heard horror stories of abusive parents. Social services isn’t really a thing here yet, so kids aren’t protected unless the home life is Jim Jones levels of bad. As such, my kids don’t have a lot of advantages that I was led to believe Korean students have. They don’t have a very high English level and my class is most likely the only place they will get to study English (or possibly get positive feedback). My “office” / English resource room. Do not mistake this for a horrible situation, however.We may not have the best facilities, but we have computers, TVs, and about a million English books. Our main textbooks come with lots of cut out activities and interactive DVD-Roms. And my “office” is the English play room/ library which is full of stories and even a short row of student accessible computers. On top of that, the kids aren’t little hellions of bad attitude or behavioral problems. Most of them are really cheerful, well behaved, respectful and pretty happy to see me. I don’t know if they’re happy to see their other teachers as well, but I get lots of greetings and big smiles in the hallways and the classroom. In the morning, I wake up before 7 am to get ready. My neighborhood is still quiet then, and when I step out onto the cold spring sidewalk, everything except the 24hr stores are closed up tight. Because I live in a pretty ritzy neighborhood, I have a bit of a bus ride to school, but it’s a nice time to wake up and see what’s in the city through the windows. Because it’s still so early, the bus isn’t too crowded and I can usually get a seat. Walking from the bus stop to the school is really peaceful. There are a million tiny shops selling fruit, sweets, snacks, and various household goods, but it’s still too early, so the little alleyways are silent. When I round the corner and my school comes in sight, I suddenly become a superstar. Kids recognize me and are happy to say hello or practice the most recent English phrase they learned in class. They call my name from across the street and run up to get high fives. It really is a great way to start the day. My first week was actually the second week of school because I spent the first week in quarantine, so you can imagine the kids were surprised to see me after their first week with no native English speaker. There were lots of curious glances and furtive shy peeking in the window. Some brave students even came up to ask what day I would be in their class. Monday wasn’t especially a typical day, but I made it through my classes with minimal technical difficulties, and learned that there are three other teachers I’ll be spending most of my time with. The other two English teachers, who I will refer to as co-teacher 1 and co-teacher 2, as well as a music teacher that is in our hallway. They’re all really sweet ladies, and did their best to make me feel included, sitting with me at lunch and chatting with me in the hallways or after class. I had to go back to the doctor on Monday after class, which is the boring part. Then I found out that we were having our first teacher’s dinner that night. EPIK orienters advised us to get in on any teacher activities to make our stay easier, but this one sounded like fun anyway. Apparently, every month, the teachers pay into a pot fund and then once in a while we all go out for a great dinner. This one was our year start dinner, and we went to a traditional Korean barbecue place. Every 4 people shared a table with it’s own grill and assortment of banchan (반찬 : the side dishes served at every Korean meal). It was the duty of the youngest at the table to cook, which is our music teacher, so she set to grilling the pork belly (Samgyeopsal 삼겹살) which we ate with the various spices, sauces and side dishes to change the flavor of every bite. I was mostly watching and following along, but it was delicious. We ate two plates full and then the waiters came by to ask us what we wanted for dinner! In Korea, after the plate of meat is all cooked and shared, people order some soup or a noodle dish to finish off. I was stuffed, but the ladies ordered a single bowl of a cold noodle soup, which I tried a bite of because they told me that most foreigners don’t like that kind of soup… so of course I had to try. It actually wasn’t bad. The noodles were a little chewy, but the flavor was nice. I think if I hadn’t been so full of pork belly I might have eaten more. My Korean co-teachers don’t drink much, so we toasted with cider. It’s not what you think. In the west, cider is made from apples, either a spiced apple juice or a hard (alcoholic) apple juice. In Korea (and Japan), cider is a clear, carbonated, sweet, non-alcoholic beverage. I have no idea why it’s called cider. Think Sprite/7Up. It was my first real day out after the flu, and I’d already had a long day at school, and the doctor, and dinner, but it was soooo good. Then they asked if I wanted to go get some dessert afterward. Imagine how sick I have to be to turn down dessert. I wasn’t that sick. but didn’t know the English name. After a while, I realized they were talking about shaved ice. Now, Americans (49 states anyway) don’t know from shaved ice. We have this thing called a sno-cone, which is small chips of ice covered bright colored sugary artificial flavored syrup. Hawaiians know a little better. They actually shave the ice instead of chipping it, resulting in a fluffy, fresh snow texture. Some of them even use real fruit in the syrups! I also had the chance to eat some Japanese shaved ice last summer in Yokohama. It was really good… compared to the only thing I’d ever known, which was of course the American sno-cone. When I tried to describe these to the Koreans however, they got looks of disbelief mixed with pity. I even showed them some pictures on my phone to get the point across. They smiled a little knowingly at one another and said that Korean shaved ice was really the best. I’m used to most people thinking their own culture is the best at xyz, so I take it with a grain of salt. But then they started showing me pictures on their phones, and one told me about the seasonal strawberry flavor that had strawberries, whipped cream and cheesecake! WHAT! So, yeah, we’re going to get dessert. We walked a long way, it might have been faster to take the bus or subway, but it happened to be a warm night while we had an early taste of spring, so I didn’t mind too much. Heck, if not for the lingering cough, it would have been idyllic. Finally, we arrived. We picked up another teacher on the way, so there were five of us, and co-teacher 1 offered to treat us all, so she headed up to the counter to order.I can’t even. Just look at it. It’s better than it looks. And it looks amazing, right? So, instead of shaved water ice, this is made with shaved milk ice. Making it way more creamy than a mere shaved ice. The bowl is filled with this fluffy frozen milk, then topped with fresh berries, cream and a slice of cheesecake! It’s served with a little dish of sweet condensed milk in case it’s not sweet and creamy enough for you. The five of us shared 2 of these monstrous creations. I’m an addict, but I can’t go alone. Even if I did manage to finish a whole one, I’d feel guilty for days. We had some great conversation too as we learned more and more about each other. I’d answered a lot of questions about myself in class for the students, but not all of them were as … honest? as possible. I mean, I didn’t lie, but when asked my favorite food/video game/tv show/book, I tried to answer things that I really do like, but that would be more familiar to them than my actual favorites. Good thing for me I like Harry Potter and the Avengers. But, at dessert, with just the teachers, we started talking about other things, and it turns out that co-teacher 1 and I are both avid Whovians. I’m pretty psyched about that. They’ve sort of decided I’m the font of all things English, which I don’t mind, but they did ask a lot of questions. The music teacher told me a story about how when she was travelling in Japan, she met an Englishman who, dressed in many layers in the warm weather, she figured must have been uncomfortable, so she told him he looked hot. Apparently this caused his face and ears to turn red, much to her surprise. I had to explain the other meaning of the word hot, and a few social context norms as to why this man would be so embarrassed to have a pretty young Korean woman tell him he was hot. This led to a comparison of our favorite stars, and it turns out we had a lot of overlap in our tastes in men too. I really can’t remember the last time I had so much fun with “girl talk”. Or teaching anyone to say “Cumberbatch”. Co-teacher 2 seems constantly surprised that I’m not a more stereotypical American. She was surprised that I could read Korean (and wanted to learn more), surprised I could use chopsticks at dinner, and surprised I was comfortable sharing a common dish while eating. I guess those aren’t normal American traits, but it was strange to run across someone with such strongly ingrained stereotypes of us. I tried to reassure her that she wasn’t necessarily wrong, that of course many Americans do live up to those ideas, but that I’d been fortunate enough to have lots of international experiences, and a group of friends at home who are way more comfortable with things like affection between platonic friends and sharing stuff like food, drinks, clothes or whatever. The rest of the week was me introducing myself to the students class after class, and having lunches with the other teachers, and hanging out after classes finishing our lesson plans or just drinking coffee and sharing snacks. One day, we took off early again to get me registered with the immigration office and start my Korean bank account. It was a lot of walking around down by the waterfront, so I got to see and explore another part of town and the weather was cool and sunny, so it was a good day for it. When we finished our errands, co-teacher 1 and I went over to Starbucks to celebrate and had so much fun sharing stories that we didn’t even realize how much time had passed and she had to run off quickly to pick up her son. Thursday was an evaluation day for the students. 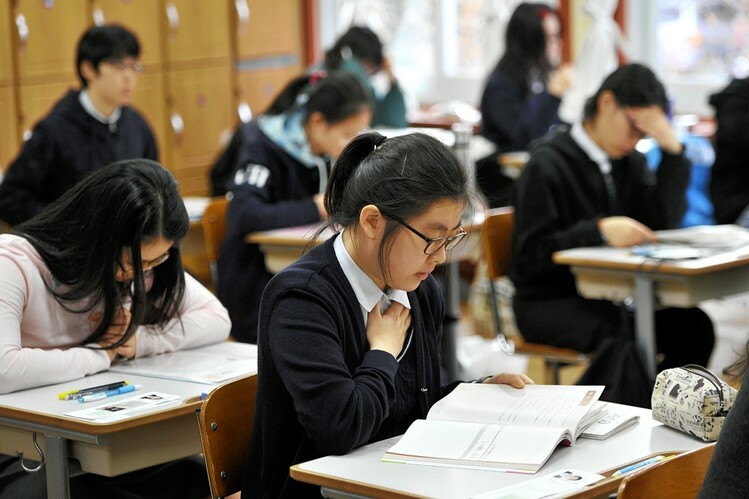 In Korean schools, there are two kinds of teachers/classes: homeroom and subject. 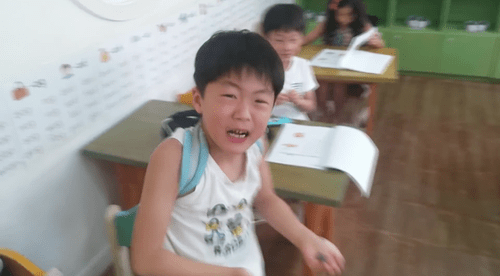 In elementary school, the students spend most of their day with the homeroom teacher who covers most things like Korean, Math, Science, PE, etc. The subject teachers are English, Music and Ethics (as far as I can tell). The homeroom teachers actually look down a little on subject teachers, which in turn frustrates the subject teachers who feel like they work just as hard (if not harder) because they have such a narrow focus. Anyway, evaluation day meant that there would be no subject classes, so we had nothing to do and spent the whole morning in one empty classroom, making a huge mess with our combined piles of drinks and snacks. There’s a lot of “desk-warming” time for Guest English Teachers, but it looks like sometimes at least, I’ll get to spend it having fun with the other subject teachers and not just stuck at my desk alone. Friday is my shortest class day, because we only have 3 classes, and we can finish our planning early. However, there’s no early leaving, so I hung out on my computer until 4:30 playing games and chatting with friends on Facebook. I’m really hoping to start using this time more constructively, like studying my Korean or (as I am doing now) working on this blog. But it was my first week, so I gave myself some permission to slack. Then, on my way out, the kookiest thing happened to me. I decided to buy a pizza from the local shop on my way home (that’s not the kooky part), but as I was walking toward the shop, a young man approached me to say hello. Now, I’m a little bit used to being a minor celebrity when I’m abroad. Really, unless you’re in a high tourist area, the chances are there aren’t a lot of white folks (or whatever the non-native ethnicity happens to be). Europe was nice, because as long as I kept my mouth shut, no one could spot me out by sight. But in the Middle East and Asia, I kind of stand out with my glowing white skin (this is not a brag, btw, I’d love some melanin to protect me from the sun’s harsh rays, it’s just not in the genes). As such, it does not freak me out when random people come up and get very curious or friendly. I watch out for signs of scams or aggression, but most of the time, it’s really just honest curiosity and a chance to see if that English they learned in school really works. So, when this guy came up to me to say hello, I was friendly back. I know in a way I represent my country when I’m out, so I try to be a good example. Plus, I’m actually a pretty friendly person and probably talk to strangers more than is strictly good for me. He asked my name, and also my age, but I’d been warned that asking someone’s age at first meeting is normal in Korea because they use age as part of the system of address (how you speak to someone older/younger than you changes). He also introduced himself and his own age. His English was shaky, but I try to be encouraging (I am a teacher, it’s a good habit). I thought that might be the end of it, since the light changed and I could cross the street, but he followed along, continuing to try to communicate. I thought maybe he lived or worked nearby and wanted to be friends, OK. We took a selfie together and I gave him my public Facebook page (not personal), then said goodbye and went into the pizza shop. Still not the kooky part. So far this has been a pretty normal cultural exchange, and I felt safe and happy. I order my pizza (a sweet potato pizza, which I have been told is a popular Korean variant and a must-try for all visitors, with a “gold” crust, I’ll come back to the pizza later), and am told it will take about 10 minutes to cook. Then the guy spots me through the window and waves me back out into the street. He then confesses his love. And asks if we can be a couple. “Couple” sounds like “cup-oo-roo”, but I know what he’s saying anyway. A thing you may or may not know, depending on your own gender and nationality, but girls hate having to turn dudes down. It’s awkward and can be scary. Often when a guy is rejected, he can become hostile, insulting us or even attacking us. It’s not a joke, it’s not an overstatement. It happens all the time. I’ve seen the police called on guys in my own regular hangout places because they got hostile that some girl wouldn’t kiss them. I’ve had plenty of dudes call me all manner of unpleasant things. So most of us learn the delicate art of the gentle turn down/de-escalation. This usually involves flattery, humor, and the inevitable presence of another man in the girl’s life. I often had to pretend to be married in the Middle East just to get away from amorous dudes. Not fun. And it’s even harder when you’re facing a language barrier. Plus, this was my first time dealing with this in Korea (every culture is different), and the whole conversation had started as normal. I was flummoxed, but tried to stay light, smiling at his compliments and saying no, no, I’m too old for you. (10 year age difference). But he kept insisting! “I love you”, “Couple”. He took off my glasses and held them away from me. I’m pretty blind, and while I have extras in my apartment, I don’t like being unable to see well. He was trying to tell me how pretty my face was without glasses, and that I shouldn’t wear them. Which is a line I don’t think I’ve heard since the early 90’s. I like my hipster argyle frames, I own contacts too, but it’s a choice… my choice. I retrieved my glasses and put them back on. I was still trying to keep it light. I’m not really sure if that was the right choice, but I was nervous about making a scene in a neighborhood that my co-teachers had described as a “slum”, and I started thinking back to the lecture on sexual assault that the US Embassy rep had given us at orientation. I didn’t really want to believe this young man was violent, he just seemed desperate, but desperation can be scary too. This went on for what felt like an eternity, back and forth. He also took my phone at one point and added himself to my private Facebook contact list (I have removed him, now, of course), and tried to get my Kakao Talk and phone numbers as well. He kept touching me, taking off my glasses and stroking my hair and face. And I kept pulling away, and saying no as politely as I could. I never let myself get angry. Looking back, I know that was a learned response to avoid conflict with males at all costs, but that upsets me too, because how the heck am I supposed to say no if a nice no doesn’t work and a firm no is attacked? Ugh. Consent issues. I finally fled back into the pizza shop, which is how I know it wasn’t actually as long as it felt, because my pizza wasn’t even ready. When I went back out and started heading to the bus stop, he caught up with me again to give me a little can of lemonade he’d clearly just purchased in the shop nearby. I tried to decline, but he tucked it into my bag anyway. In the end, he got a kind of cold fish hug, but took the opportunity to smell my hair. Leaving me totally creepified. I spent the whole way home looking like a crazy person, muttering to myself and going over and over the experience trying to figure out where it went from normal to nuts and what I could have done differently. Even then, it took talking to three different girl-friends online about it to calm down enough to enjoy my pizza. Most countries have imported the pizza over time. It doesn’t always look like what we think of pizza as in America. Sometimes the crust is a totally different texture, sometimes the sauce is sweet or spicy, or not made of tomatoes at all. The toppings can be anything, literally. In China, I saw pizza that used mayonnaise instead of cheese because they’d only seen pictures and didn’t know what it was. So, when I came to Korea, and my instructors told us about the sweet potato pizza, I was very curious. I really like sweet potatoes. And pizza. So this seemed like a match made in heaven. My pizza was cold by the time I got home, but my apartment has a microwave, so that was ok. It turns out that sweet potato pizza is one of the ones without tomato sauce. The box declared proudly that the crust was made from organic flour (kind of surprised that’s a thing here) and Korean rice. There are small diced vegetables like onions, green peppers and roasted corn, as well as some kind of sausage reminiscent of Italian. Then, placed like a crowning jewel on each slice, is a single chunk of roasted sweet potato (or possibly yam), and the whole thing was covered in mozzarella cheese. The “gold” crust turned out to be a satellite rim of mashed sweet potatoes, topped with cheddar cheese that had toasted in the oven. Not really like anything I’d have described as “pizza”, but quite delicious nonetheless. Finally, on Saturday, a large group of EPIK teachers organized a March Birthday party. It just so happened they chose to meet right in my neighborhood, so even though I was still recovering from the flu, I decided I could go out for an hour or two. We met just outside the subway station to gather everyone from all parts of Busan together, then marched off in seach of our destination. With a group as large as 30-40 people, it can be hard to find a place, but apparently Korea has these kind of “bar cafeteria” things, where you pull up a table (or group of tables), then you walk around the area getting your food and drink from various stands around the large room, a little like fair booths. One booth has the booze, another has grilled meat, another stir fry, etc. When you pick up your goodies, you tell them your table number and they log it into the computer. Then, at the end of the night, you pay for what you got. When we arrived, the escalators didn’t go all the way up, and there wasn’t any stairwell access, so we had to take the single elevator up in small groups. I ended up being the first one to arrive, and the host asked how many people we would have. I have learned enough Korean to count, so I told him 30. I’m sure he must have thought I was not speaking Korean correctly, because he asked again with some serious disbelief. After all, I was standing there alone. I kept affirming my estimation, and several more hosts were gathered together until they found one who spoke English and he checked the number again. Yep, that many, really. They put together about 10 tables for us and showed me to the area, taught me about our table pager that would track our orders and buzz when food was ready to be picked up, and finally more of the group started to arrive, preventing me from looking like a serious fool. It was strange but nice seeing familiar faces, even if we’d only met for a week in orientation. We tried so many flavors of soju and tried to find a local beer that wasn’t totally awful. I tried a dish of kimchi fried rice topped with mozzarella cheese which turned out to be MUCH tastier than it sounded, and I even met some new people to connect with on Facebook and here in Busan. Of course, I want to hang out with my new Korean friends too, but it’s nice to know that there are lots of events where I can catch up with expats and stop speaking ESL or broken Korean for a few hours at a time.